Many wedding traditions have certainly gone by the wayside as couples opt to make their special day more personalized to their unique tastes. But what about the financial aspects? Should traditions be upheld here? What if there are divorces, second marriages, or if the couple has lived on their own for some time? ENGAGEMENT PARTY: Bride pays or hosts. REHEARSAL DINNER: Groom pays or hosts. BACHELORETTE/BACHELOR PARTY: Maid of Honor and Bridesmaids pays for Bachelorette, Best Man and Groomsmen pay for Bachelor Party. STATIONERY: Bride pays for invitations, announcements, and programs. CEREMONY: Bride pays for the church or synagogue, organist, sexton, etc. Groom pays for the marriage license and officiant. ATTIRE: Bride pays for the gown or dress, veil, and accessories. Groom pays for the tux or suit. Each attendant pays for their own dresses and tuxedos or suits. FLOWERS AND DECORATIONS: Bride pays for the arrangements for the ceremony and reception, and bouquets and corsages for bridesmaids and flower girls. Groom pays for bride’s bouquet, boutonnieres for the men, and any corsages for mothers and grandmothers. RECEPTION: Bride pays for all services, including catering and decorations. RINGS: Bride pays for Groom’s ring, Groom pays for Bride’s rings. HONEYMOON: Groom pays for complete honeymoon. PHOTOGRAPHY: Bride pays for all wedding photos and videos. 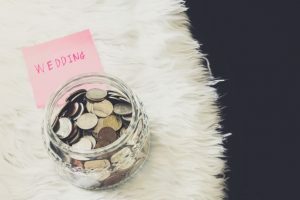 However you choose to handle the finances of your wedding, making sure you get the day you’ve always dreamed of is the top priority. It helps for couples to make these decisions together with their families so no one feels burdened. This can also be especially helpful when one or both sets of parents are divorced or separated. We recommend first budgeting your expenses and knowing where you stand on each item. Where you want to spend the most money can vary couple to couple. When you’ve ironed out all of the tricky details, give our event planners a call at 973-903-7750. We’re ready to help you put all of your dreams into action.